Jon’s first solo outing was a very successful one, featuring the hit #1 song “Blaze of Glory” (which won a Golden Globe and received Academy Award & Grammy nominations) and the album achieved double platinum status. “Miracle” was a minor hit, getting to #12 on the singles chart. 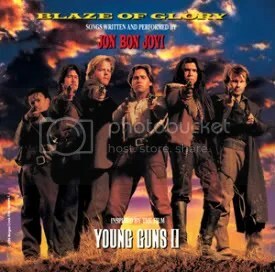 The story goes that initially, Young Guns II star Emilio Estevez was seeking Bon Jovi’s “Wanted Dead Or Alive” but Jon declined allowing the use of it because he didn’t think the song fit the movie, but he was inspired to write original pieces for the film and its soundtrack and thus, the Young Guns II soundtrack doubled as Jon’s 1st solo release. It’s no surprise Jon was hyped about writing a bunch of cowboy rock ballads because Bon Jovi had already been doing it for years with songs like “Wanted Dead Or Alive”, “Stick To Your Guns” and “Ride Cowboy Ride” (and later, “Good Guys Don’t Always Wear White” for The Cowboy Way soundtrack). The album, written solely by Jon, is basically more of the same and that’s to say it’s an enjoyable album. It doesn’t stand next to the band’s best, but it’s still a solid release and way better than his second solo release, 1997’s Destination Anywhere. Back in the day, when “Blaze of Glory” was a hit on the radio, I used to think it was a Bon Jovi song and not a Jon Bon Jovi song. It’s become synonymous with the band though because there’s really no difference in sound and it was included on the band’s 1994 greatest hits compilation Cross Road and has been performed in concert over the years. For this effort, Jon assembled an impressive lineup of guest musicians including Elton John, Jeff Beck, Little Richard, Ratt’s Robbin Crosby and then Bon Jovi pet project Aldo Nova!